Insert the SIM card (mini-SIM, 25 x 15 x 0.76 mm) that you received from your mobile network operator into the SIM card slot with the slanted edge of the card on the left and the contacts facing downwards (see fig.). Screw the two LTE antennas included in the package onto the LTE antenna sockets on the FRITZ!Box. 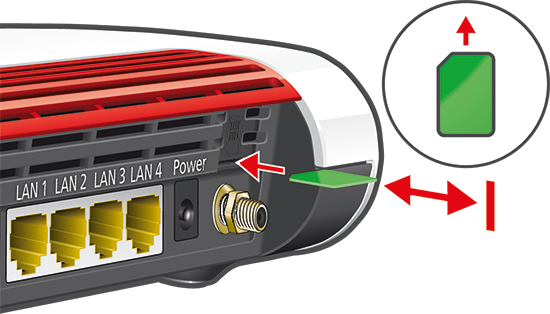 Important:If you are using the FRITZ!Box in an area located on the edge of LTE radio coverage, the two LTE antennas included in the package may not be sufficient for a stable radio connection. In this case, use a outdoor LTE antenna. Enable the option "Access via mobile network" and click "Next". Enter the PIN (Personal Identification Number) for your SIM card in the wizard. Important:The PIN contains only numbers and not letters or special characters. If you enter the wrong PIN three times, you must enter the SuperPIN/PUK. Refer to your mobile network operator for information on the PIN and SuperPIN/PUK. Now the FRITZ!Box determines your mobile network operator and internet service provider. 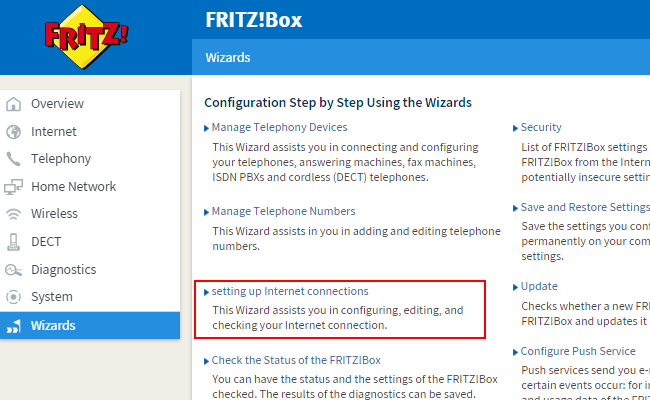 If your internet service provider or plan is correctly displayed, click "Next" and follow the wizard's instructions. If your internet service provider could not be determined, or the incorrect internet service provider or plan is displayed, click "Change Internet Service Provider" and follow the wizard's instructions.